Fine Metallic Etchings Enhance The Quality And Attention To Detail That Sets Lanier Apart. Beautiful etchings set our Majestic Fountain Pen apart, and are a wonderful way to convey the impression of a detail-oriented, classy establishment. As easy to customize as it is to use, the Majestic Fountain Pen is indeed a wonderful way to impress almost any client in any industry, making your purchase - and company - an unforgettable one to all who partake. Place your order today in order to get the edge on the competition! Lanier will also be happy to personalize your Majestic Fountain Pen with an engraved name or message of your choice should you so desire, and one of our beautiful rosewood gift boxes can also be purchased for an extra dash of luxury and panache. A wonderful, distinctive pen that makes a great choice for everyday use, the Majestic Fountain Pen by Lanier is a remarkably good choice for a range of uses and occasions. 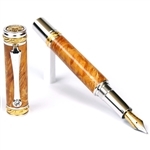 Perfectly balanced when it comes to weight, this beautiful and well-made pen is available in your choice of many different exotic hardwoods that are polished to a high-gloss finish , and completed nicely by the rhodium and 22k gold components that comprise the main accents of this piece. Additionally, a sparkling Swarovski crystal adds a distinctive flourish to the clip of the Majestic Fountain Pen, making this a particularly eye-catching stylus to add to your collection or to offer as a gift. Besides the fine, exotic, and beautiful elements that comprise most of the pen itself, the Majestic Fountain Pen also features an equally durable and lovely cap, featuring custom casted 3D rings for added strength and beauty. These pens should hold up wonderfully to normal use when stored correctly, and should provide an air of distinction and elegance to your desk and penmanship for many years to come. The Majestic Fountain Pen accepts the Private Reserve sealed ink cartridges in many different colors, so be sure to stock up on your favorite hues when you buy. Furthermore, Lanier also offers 50 mL bottles of Fast-Drying ink or traditional fountain pen ink to complete the writing experience of bygone days. Should you wish to switch between cartridges and traditional inks, fountain pen converters - available in either high-end or lightweight versions - can make the transition easy and painless.